The Book Guardian: I'm tired of monkeyin' around! 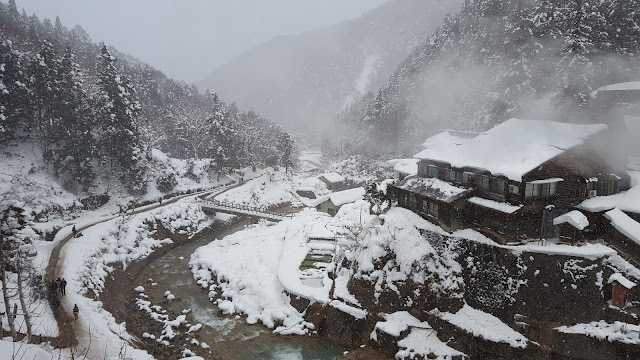 In one of our many efforts to be proactive about seeing everything we want to see in Japan, Blake and I took off for a little weekend mini-break the first weekend in January to Nagano prefecture. 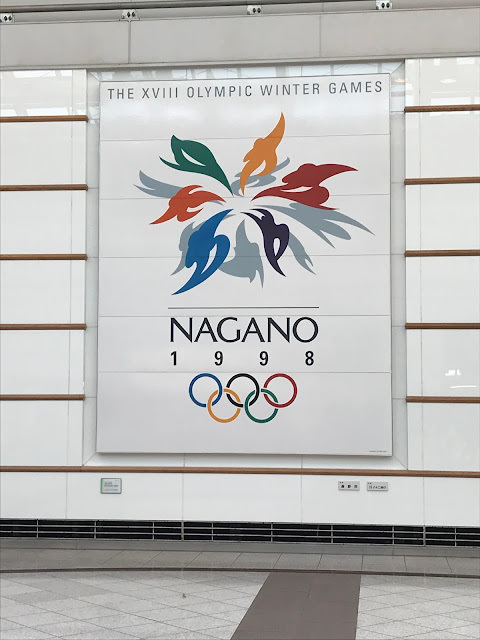 Nagano city hosted the Olympics in 1998, and there were nods to the 20th anniversary present around town. We left early Saturday morning, took a couple of regular trains to Tokyo, then boarded a shinkansen (bullet train) to Nagano. 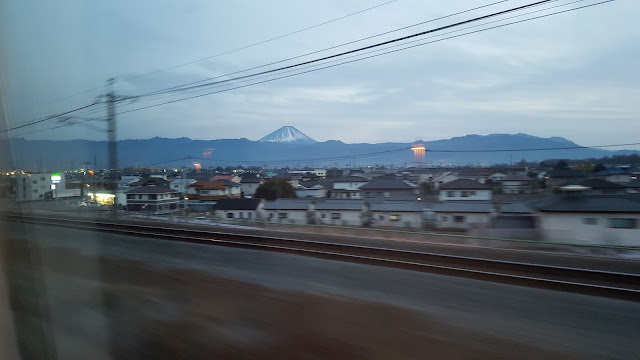 On this leg of the trip, we learned how to find seats on the shinkansen when you didn't buy your tickets early enough to reserve a seat. Fortunately, we found seats together and were in Nagano in no time. Our first stop was Zenko-ji Temple. Actually, that's redundant, even though you'll hear it a lot - (Name)-ji Temple. Ji actually means temple. So, it's like saying ATM machine. But back to the temple! Zenko-ji is one of the oldest Buddhist temples in Japan - according to legend, its golden triad was the first Buddhist image to arrive in the country from the Korean peninsula in 552. 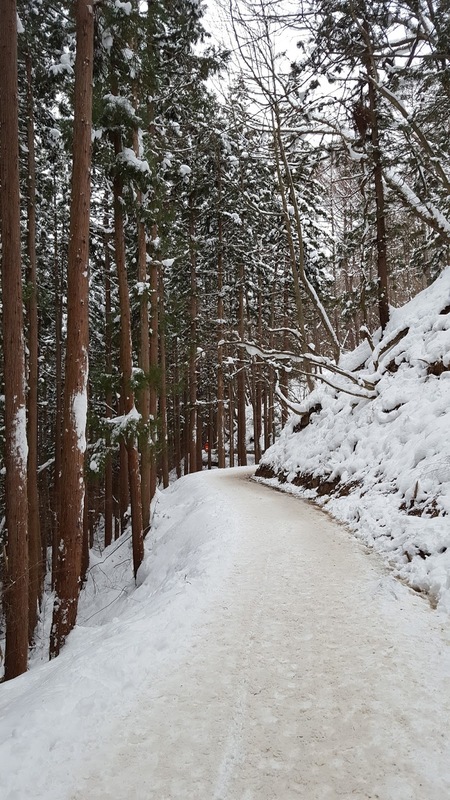 After some dispute between warring clans, it was rescued by a man named Yoshimitsu Honda (whose name reads as Zenko in Kanji) and enshrined in Nagano. The main hall currently dates from 1707. We had arranged for a free guided tour from a volunteer, which we really appreciated. 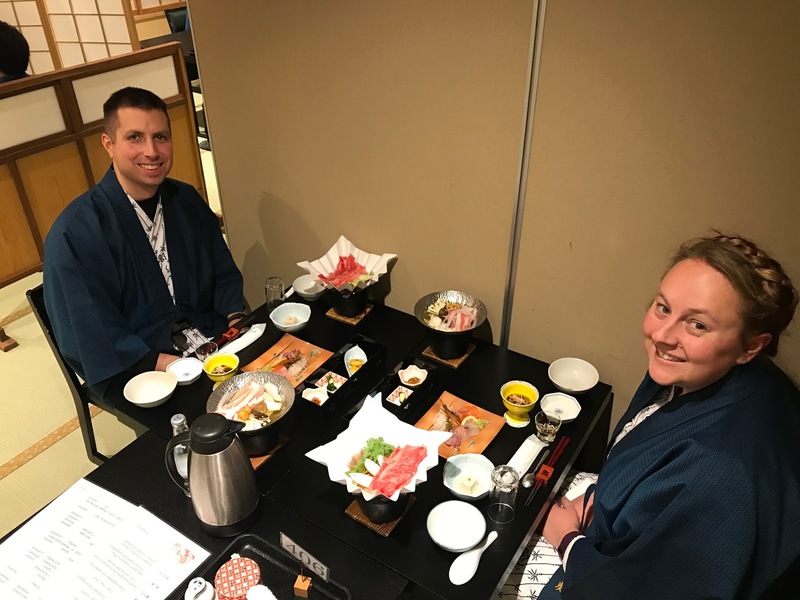 After visiting 14 temples earlier in the week, I was definitely feeling a "templed out" and she helped us learn some new things and find the top things to see within this complex. One such experience was a walk down underneath the altar in the main hall, passing through a pitch black tunnel with our right hand on the wall, searching for the Key to Paradise. One touch apparently ensure eternal salvation, so I guess we're set! This is still a very active temple with many pilgrims attending it throughout the year. At this point in the journey, we learned about how to buy shinkansen tickets in advance from the ticket machine at JR stations (super easy when you can press the English button first!) and got all our tickets for the rest of weekend arranged. 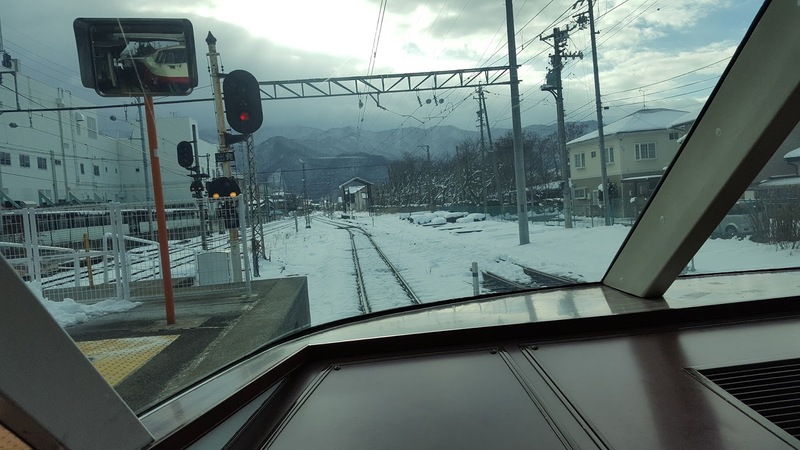 Also helpful, since a lot of the public transportation in the Nagano prefecture does not accept the prepaid train cards we use at home. 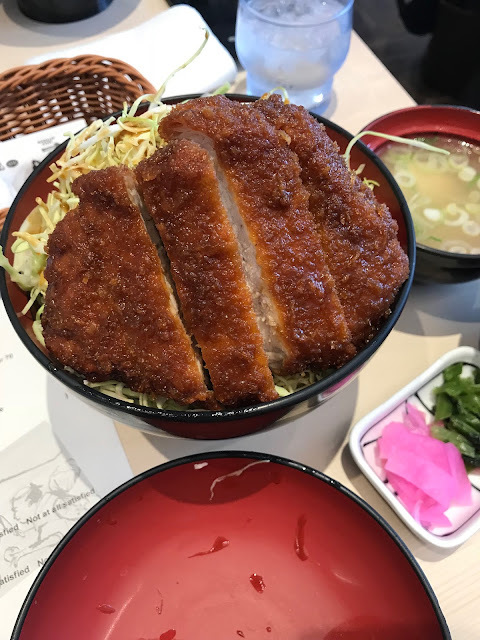 Then, it was time for a quick and delicious lunch of katsu-don (tonkatsu or fried pork cutlet over rice) and then north to the snow monkeys! 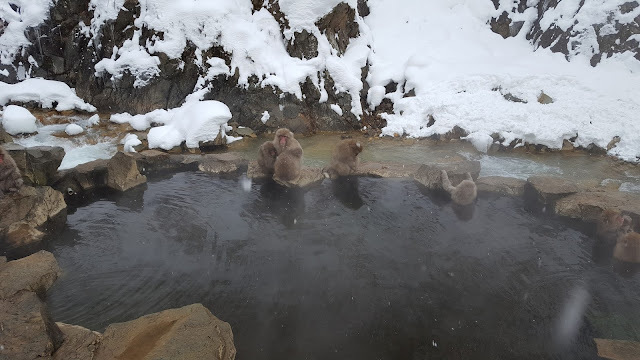 We were picked up at the train station by our ryokan (traditional Japanese inn) and after checking in, they dropped us off at the snow monkeys! It was about a 25 minute hike in, and we definitely scurried as much as we could despite the snow, since the park was closing an hour later, but we made it and it was delightful! 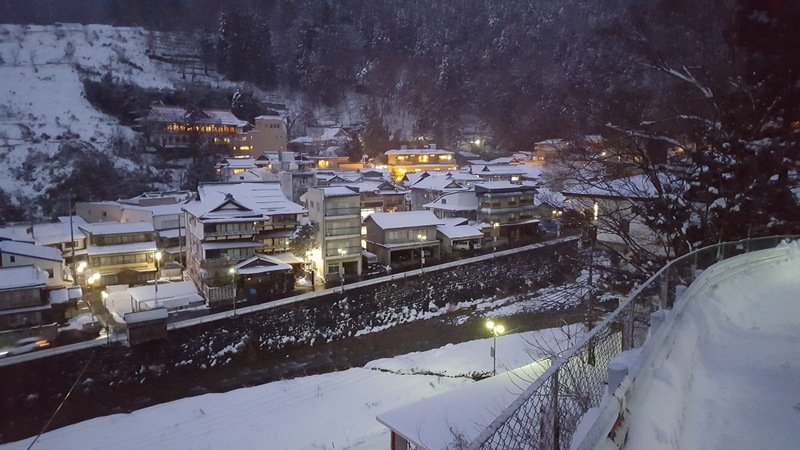 As we hiked back down, the snow started in earnest, but we missed the bus (and didn't want to wait more than an hour for another) and chickened out in calling a cab with the language barrier (hailing one is fine), so we just hiked all the way back to the ryokan and were rewarded with a beautiful view of the snowy town in the twilight. 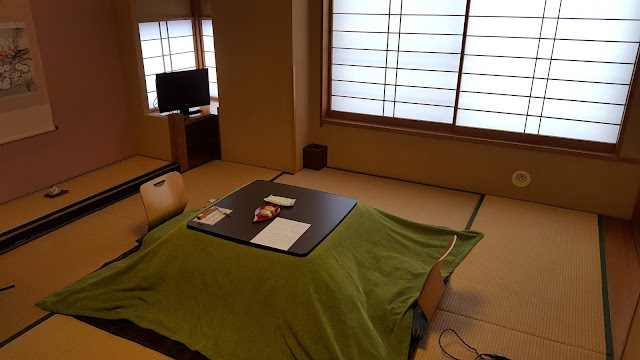 Once in our room, we warmed up under the kotatsu (heated table), changed into the provided yukata, and wore them to our traditional Japanese dinner. We had an menu in English to help us know what at least most of it was, and we at least tried all of it (except the plum wine). 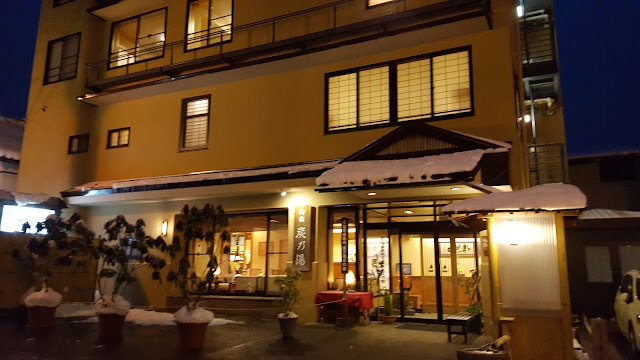 After dinner, we went to the onsen on the top floor of the ryokan. It was small, with just one bath inside and one outside, but we each had the place to ourselves (still separated for men and women) and it gave Blake a chance to finally try one! 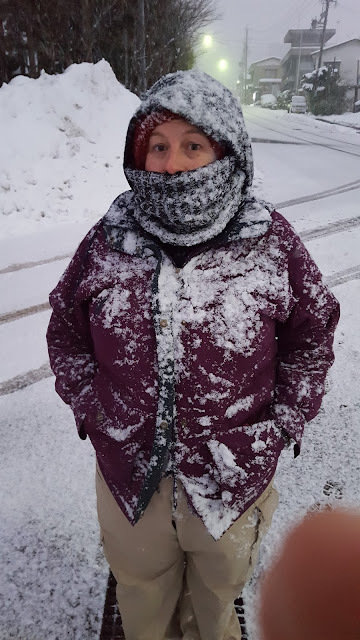 I especially enjoyed the outside. It was night, the snow was falling and collecting just outside the tub, which was made of stone. The snow was falling on my head and shoulders, and as I leaned over the edge and looked out over the town below the partition, the snow fell on my back. 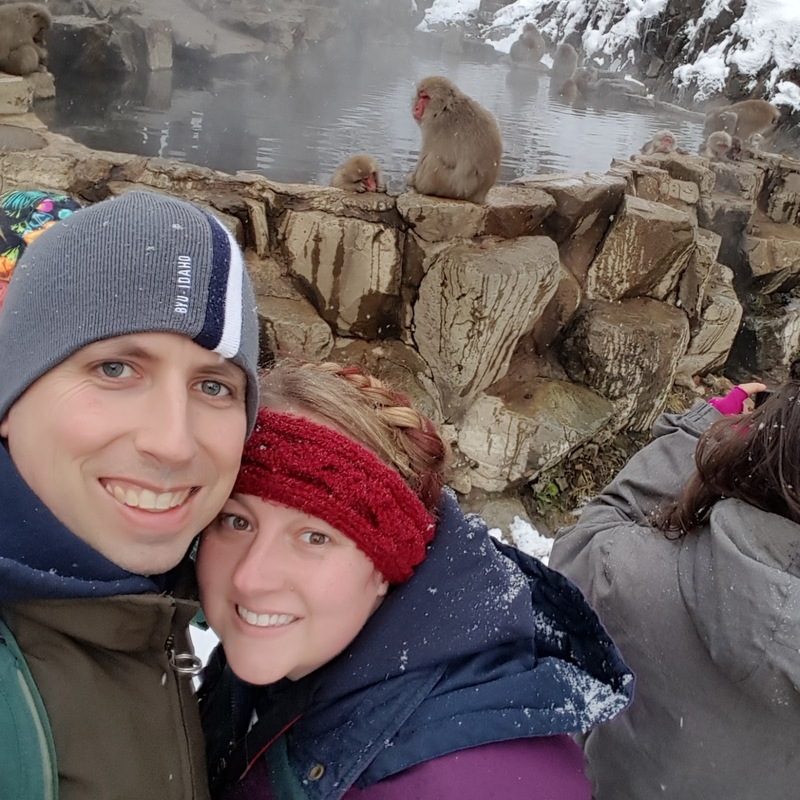 I felt like a snow monkey myself, and it was magical! We actually could have walked around town (called Shibuonsen) and tried nine different onsen with different healing properties, but we were just too tired from a very long day. 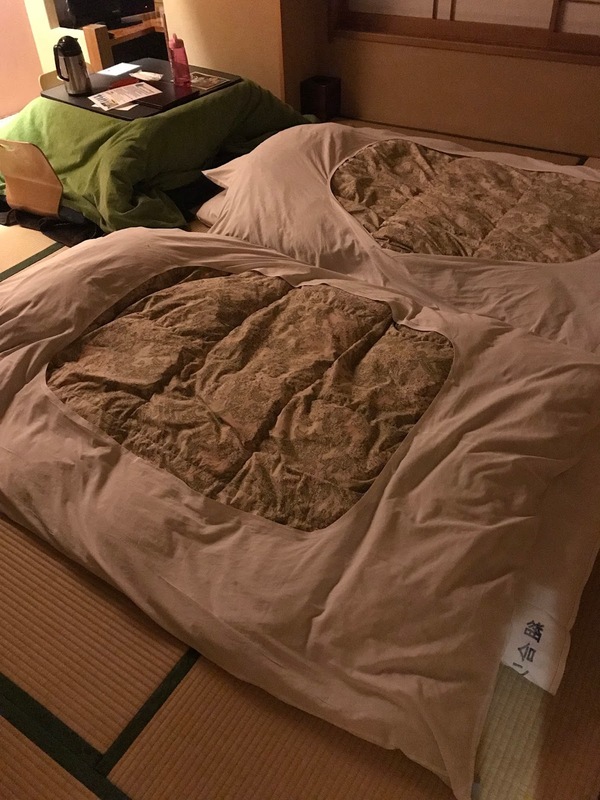 Being exhausted made it pretty easy to fall asleep on the futon on the tatami floor of our room. 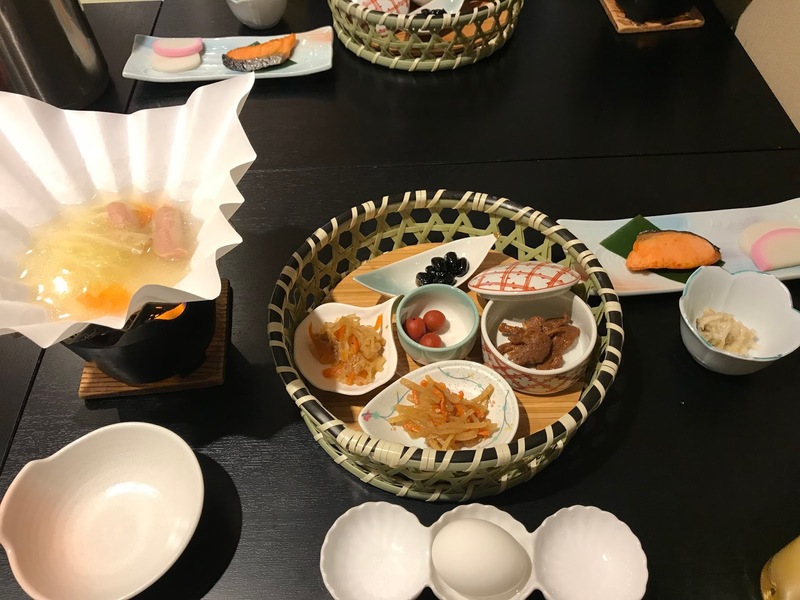 Sunday morning, we enjoyed a Japanese breakfast before getting a ride to the train station and heading to Matsumoto. We had the best seats on the train! The train engineer was actually in a compartment above our heads, so as not to impede our view. I called my nephew and Eilonwy's kids on video chat to let them "vroom" with us! We had spotted these seats on the train on Saturday, so we made a dash to them on the train back. Our destination for the day was Matstumoto Castle - the most complete of any of Japan's historical castles - and its history dates back to 1592. The castle keep still stands, which was for use by the samurai defending the castle, and it was a bit of a challenge to climb all the stairs which were more like ladders, but it was worth it! We also enjoyed the Matsumoto City Museum, since we had some extra time. The legend is that the seven lucky gods arrive in a boat every year - this used to be paraded through the town in celebration. Our train back wasn't for a little while, so we decided to have lunch at McDonald's (I did try the ginger pork burger to make it interesting!) and relax there. 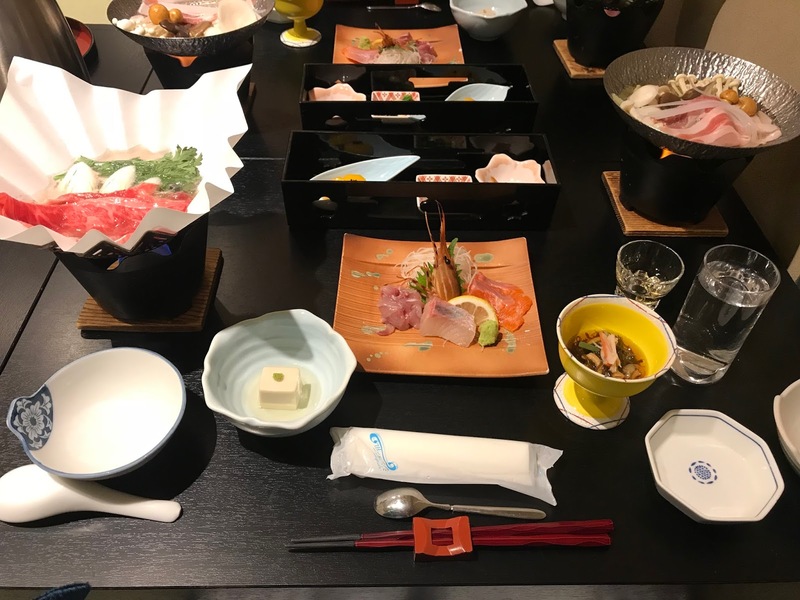 The upstairs of many fast food places in Japan are popular for eating and just spending time, maybe or maybe not being productive. We talked a lot and played Carcassone on the iPad. Others were napping or studying or reading, so we were in good company. 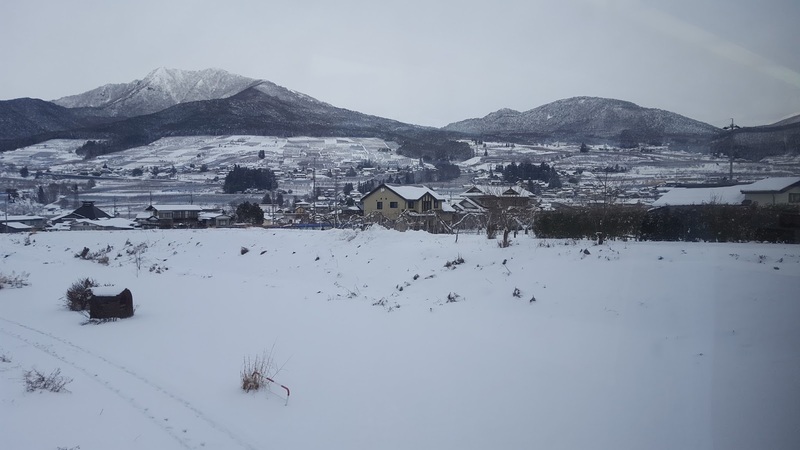 The train ride back was also relaxing - it's really nice not having to drive or navigate. It was definitely a full and fast weekend, but we loved it! That sounds like an awesome weekend! Makes me want to go cuddle up with some warm blankets. The onsen sounds amazing. And we definitely enjoyed zooming with you.